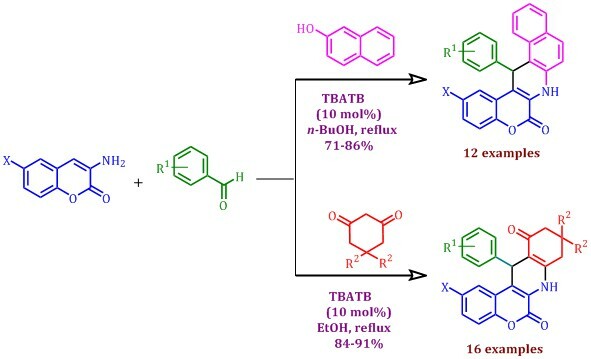 The synthesis of benzo[f]chromeno[3,4-b]quinoline-6-ones has been achieved via one-pot three-component reaction from substituted aromatic aldehydes, 3-aminocoumarins, and 2-naphthol in n-butanol using 10 mol % of N-tetrabutylammonium tribromide (TBATB) as catalyst under reflux condition. The product formation is going through tandem Knoevenagel–Michael reaction followed by concomitant cyclization. The most noteworthy features of the present protocol are environmentally benevolent reaction conditions, simplicity of procedure, high atom economy, easy accessibility of the catalyst, cost effectiveness and superior yields. 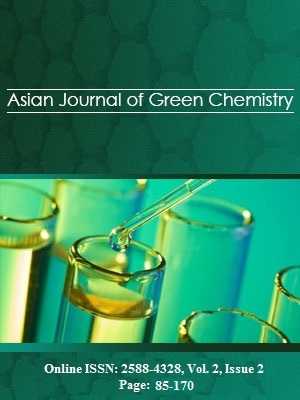 In addition, TBATB has also been found to be an effective catalyst for synthesising chromeno[3,4-b]quinoline-6,11-diones from substituted aromatic aldehydes, 3-aminocoumarins and cyclic 1,3-diketones with better yields in shorter reaction time.